When you visit Kenya, the Intercontinental Hotel Nairobi will offer you a comfortable stay. It’s one of the top-end hotels in the city. There are lots of handy services right on-site, fine dining and quality rooms. There are nearly 400 rooms at the Intercontinental Hotel Nairobi, and 13 larger suites for those who like more space. All of the guest rooms have satellite TV, a mini bar, Internet connections, private bathroom, an in-room safe and air conditioning. The rooms are large and tastefully decorated. If you're travelling with children, take advantage of the baby-sitting service and you can get a crib for your room. Other hotel services include a sauna with whirlpool, beauty salon, sport center, a fully equipped fitness gym (for a small fee), gift shop, staffed business center and even dry cleaning services. The staff speak English and Swahili, as well as Arabic, French and German. The hotel also has good facilities for disabled persons. The many restaurants at the hotel will suit any taste, and give you plenty of meal choices each day. The Terrace has an all-day buffet for casual meals of international dishes. More formal dining can be had at the Italian Prugna D'Oro, or if you prefer Indian cuisine, Bhandini. It’s restaurants have an good reputation in the city. For later entertainment, the Safari Bar serves drinks, snacks and a good dose of music. Even later dining can be found at the 24-hour Plantation Lobby Café. The hotel is just outside of the city, which makes it perfect for vacationers who prefer a quiet surrounding. Even so, it's just 20 minutes by cab from the Jomo Kenyatta airport, along the Uhuru Highway. You are just a few minutes away from many of the popular tourist sights in Nairobi. The large Nairobi National Park is only 10km from the hotel, making it a short drive to see lions, rhinos and giraffes in their natural habitat. This is definitely a must-see for anyone coming to Nairobi. It’s a full wildlife resort and vastly underrated. Even closer than the National Park are the Bomas villages, the National Museum, the Karen Blixen Museum and the historic National Archives. About an hour away is the Nakuru National Park, for more chances to watch the local wildlife. If you are travelling for business, the Kenyatta International Conference Center is practically next door to the hotel. All in all, the Intercontinental Hotel Nairobi is a good spot to launch your Kenyan holiday, with excellent facilities and a location that's close to everything. 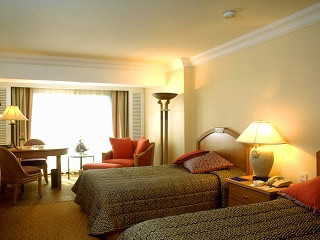 For more information, user reviews, pictures and rates, check this hotel at Hotels Combined. Compare their Nairobi hotels here. Hotels Combined is probably the biggest hotel website on the internet with a relative large selection in Kenya.